Ceviche is perhaps the most known peruvian dish. There are lot of ways to prepare it, basically changing the kind of fish used, and probably some of the vegetables depending on the availability. You should not consider this as “the ceviche recipe” as long is just my way to prepare and enjoy it, you will find lot of recipes across the web and I just expect this one likes to you. Cut the hake without spines and skin in square pieces of about half inch. Cut the prawns in 3 or 4 pieces. Chop half red onion, chop also one tomato and chop a bunch of coriander. Finally squeeze 2 limes over all the ingredients, add salt and olive oil, mix well and let rest half hour before serving. 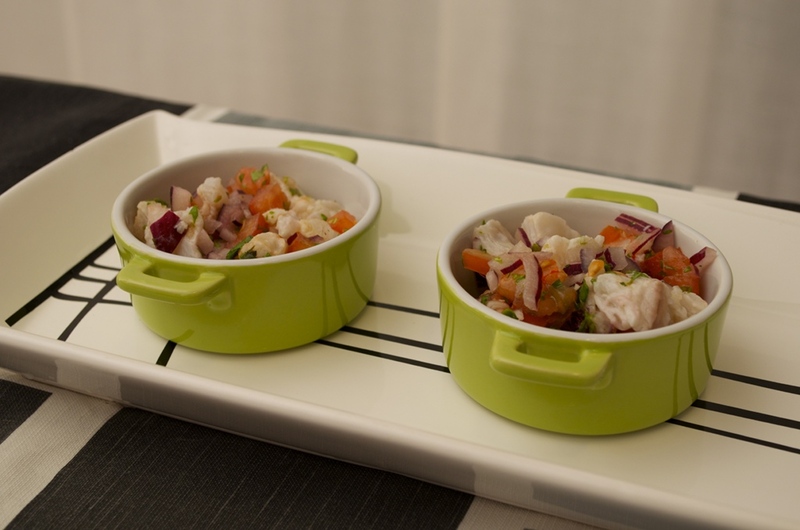 You should eat all the ceviche after preparing it, if yo try to eat ceviche like next day or some hours later the taste and texture won’t be the same.